This fort was built to keep an eye on Belgaum and its nearby routes. Queen Chennama of Kittur hails from Kakti. This fort stands on a small hill towards Kolhapur while going from Belgaum. 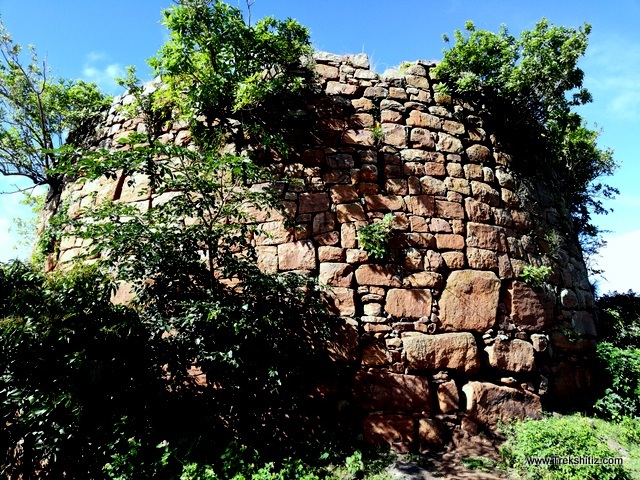 There aren�t much structures on this fort as it ws mainly used for watch keeping purpose. The only bastion and remnants of its fortified wall can be found on this fort. To reach this bastion one has to climb 250 stairs built in cement concrete. The forest department has undertaken afforestation on a large scale on this fort. Also many trenches have been dug to arrest water flow and to allow it to percolate. Due to this it becomes bit difficult to roam around the fort and thus other structures if any cannot be found. Belgaum can be seen from the fort top. Kakati village is 11 kms before Belgaum on the Mumbai � Banglore highway. The fort stands behind the village and can be accessed by a proper road.